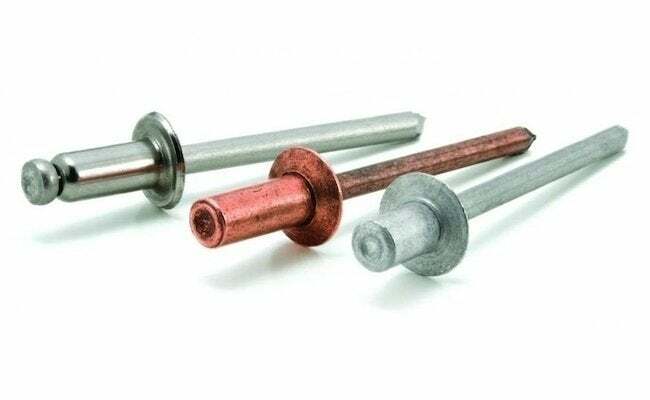 You may never have heard of pop rivets, but if your project calls for patching metal, you'll be glad to make the acquaintance of these handy, reliable fasteners. Do you need a quick and easy way to fasten a patch onto sheet metal? Pop rivets make it pretty easy to do so. They come in various sizes and, when installed correctly, create a strong, durable bond between the metal patch and the sheet you’re attaching it to. Pop rivets work like this: First, you position the patch where you want it and drill holes around its perimeter. Next, working one hole at a time, you insert the long, nail-like end of the rivet into a special tool similar to pliers. Insert the rivet through a hole you’ve drilled and then squeeze the handles of the tool; that causes the ends of the rivet to flatten out and be drawn together. When the rivet is fully compressed, the nail-like end snaps off and is discarded. Pop rivets are also called “blind rivets,” because of one very big plus: They can be used even when only one side of the material you’re working with is accessible.